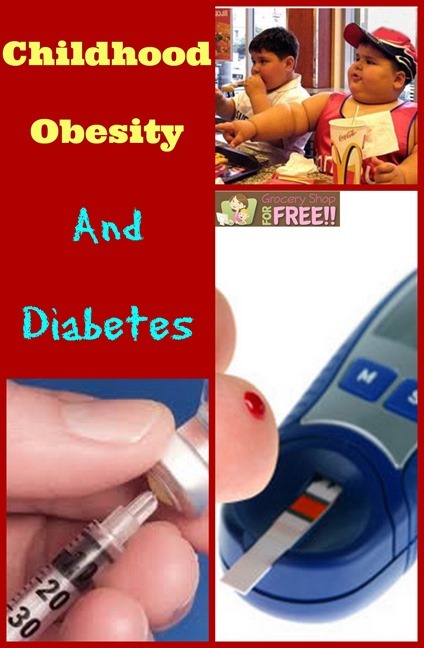 You are here: Home / Family Living / Parenting / Childhood Obesity And Diabetes! I wanted to talk a little about an epidemic we are seeing and I am afraid we are beginning to accept it rather than fight because it has become so common. I am talking about Diabetes. There are 2 kinds Type 1 (used to be called juvenile diabetes) and Type 2 (used to be called Adult Onset). Type 1 normally would manifest before 25 years of age and Type 2 would normally manifest in adults over 30, but, now, they changed what they call them because those rules no longer apply. Type 1 is genetic and you can control it, but, will more than likely always take shots for it. We are seeing more and more kids getting Type 2 Diabetes than ever before. Diet and exercise play a huge part in Type 2 Diabetes. Many blame the lack of exercise, video games and less outdoor physical playing as well as bad diets, and supersized everything. I was talking to some old friends this week about a Burger King we used to go to with our parents. We laughed that they had a “walk up window”, no drive thru, no playground, no kid’s toy, no dining room, and no supersized anything. All of that came years later and now everything can be supersized including us and our kids :/. As the years passed and we supersized everything and forgot what a portion size was, we decided people come in all shapes and sizes and that it’s ok. But, not when it affects our health as badly as it does. There are many obesity related health problems and I think Diabetes is the worst especially when it affects so many of our children. You see, I personally have experience with Type 1 Diabetes and Type 2. I was married for 15 years to a Type 1 Diabetic, I learned quite a lot about it. He was diagnosed as a kid when he went into a Diabetic Coma. From that time on he had to take daily shots, often more than once a day, as well as prick his finger to make it bleed several times a day to check his blood sugar levels. As he got older, the disease took its’ toll. Diabetes, Type 1 or Type 2 affects your organs, and your body very badly. It’s not just that you eat differently and take a pill (in the case of Type 2), even with the meds and diet it affects your body. Diabetes is a degenerative disease which means it attacks your organs and continues to deteriorate them. My husband was in the hospital quite often and my kids were very familiar with and slept often in the waiting room. Some of the things he dealt with over that 15 years were the blood vessels behind his eyes leaked which could lead to blindness and he had to have many painful treatments to close the vessels with lasers, he had multiple heart attacks, his kidneys completely shut down and he was on dialysis for the last few years of his life, and finally he passed away at 35 years old. All from complications due to Diabetes. Type 2 or Type 1, the disease is dangerous, and deteriorates your body. It worries me that so many kids have it, and I am not sure the education is getting through to us that it is dangerous and these kids may not live to a “ripe old age”, and many won’t outlive their parents, if we don’t do something. Now, I was diagnosed with Type 2 Diabetes a few years ago and I lost over 100 lbs and cut out most sugar and carbs. I was shocked that I was obese – I reserved that word for people who had to be buried in a piano case – that is NOT the case, all you have to be is 20% overweight to be considered obese, that shocked me! The Dr. will check me for symptoms and I don’t have any, I no longer take the meds for it, and they tell me as long as I continue this way I don’t have to be concerned with any degenerative issues. If you have a child with Type 2 Diabetes, please study and learn all that you can, also educate your child about their disease. If you have children, please help them make good diet and exercise choices, and prevent this from happening to them.